The November 13 meeting of Cabell County Master Gardeners will be held at 6:30 pm at Enslow Park Presbyterian Church. The education session will be a video downlink with Dr. Matthew Fischel who will be sharing his expertise on succulents. 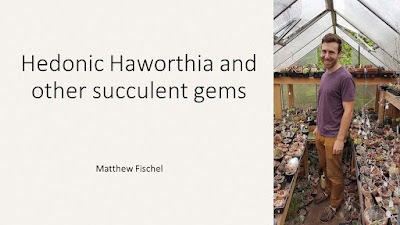 Dr. Fischel has studied succulents for many years and has a special interest in Haworthia. He has traveled to southern Africa to research these succulents in their native habitat and has had success in cultivating them at home. Dr. Fischel's presentation with his presenter notes is available for download HERE. Following Dr. Fischel's presentation, we will have a brief but important business meeting that will include the election of officers for 2019-2010 and approval of the 2019 budget. The proposed budget can be viewed here - Proposed 2019 CCMGA Budget. To reflect our status as a nonprofit organization, the web address for CCMGA has changed to www.cabellcountymastermardeners.org. Since we are not a commercial enterprise, our previous .com address didn't seem as appropriate as a .org account. 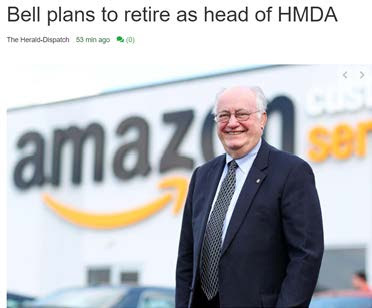 Everything else about the CCMGA website should work as usual. After a lengthy vacancy in the agriculture extension agent positions in Cabell and Wayne Counties, the position was recently filled. James Evan Wilson, a graduate of WVU, will split time between the two counties serving the agricultural needs of the area. Evan grew up in the Mason County community of Apple Grove and comes from a strong agricultural background having been involved in 4-H and FFA as a student. He has recently completed he Masters Degree in Agriculture, Natural Resource and Design and has worked in poultry in Virginia. Evan will bring a great deal of knowledge, energy and resources to the two counties that we serves. He is looking forward to meeting the CCMGA members from Cabell and Wayne Counties to explore ways that we can work together. Please remember to join us for the May 8 CCMGA meeting at R>L. and Linda Mallory's farm in Culloden, WV. The Mallorys are great hosts and I know that everyone will enjoy seeing the work of Linda's green thumb in her gardens and greenhouses. This meeting is also special because it is the graduation of the 2018 class of Master Gardeners. If you have a GPS in your car, you can enter the coordinates 38.425294, -82.061668 to get to their place.. If you would prefer, you can meet to caravan or car pool at the Milton Park and Ride, just off exit 28 of I-64. We expect to leave the park and ride at 6:15 pm. CCMGA members have been invited to join with Master Gardeners from Eastern Kentucky on the evening of Tuesday, June 19. The Kentucky Master Gardeners will furnish the main courses (turkey, dressing, ham) and others are asked to bring a side dish or dessert to share. The event will begin at 6 pm and will be held at Kentucky Roots which is Route 3 between Ashland and Louisa. The link below shows a map of the location. There will be three speakers discussing the potential for hemp farming in the area. CCMGA members will know many of the Kentucky Master Gardeners from sharing a booth at the WSAZ Home and Garden Show. If you are able to attend please RSVP to Rhonella Chaffin at rhonella@att.net or 606 483 6077. This is a great opportunity to get a high quality attractive rain barrel at an excellent price. 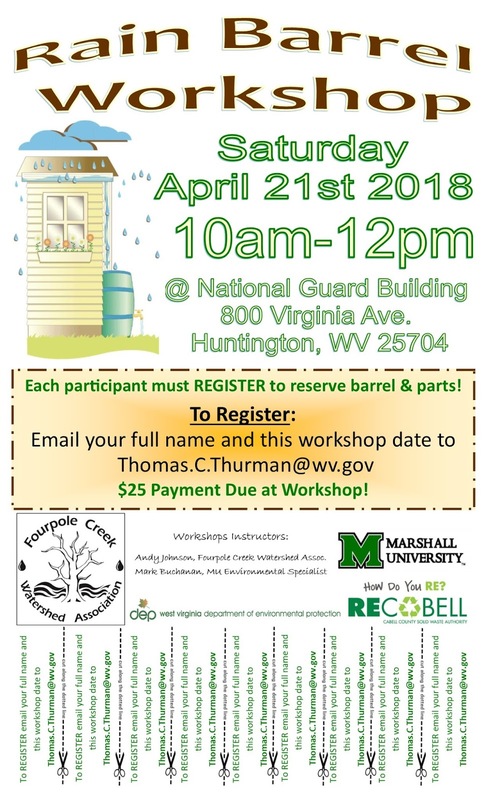 The workshop is in the National Guard Building at 800 Virginia Avenue, Huntington and runs from 10 am until noon on Saturday, April 21. Pre-registration is required (Thomas.C.Thurman@wv.gov) and the $25 payment is due at the workshop. times since we started counting.